You know something’s serious when the police gets involved. 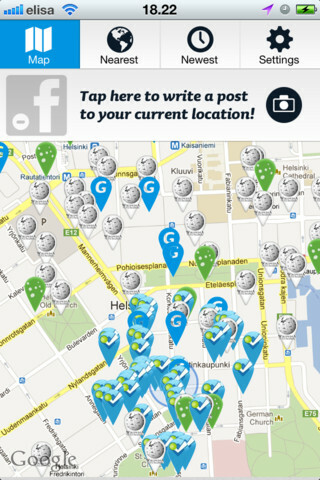 But in the case of Helsinki, Finland-based location-based app Grafetee (www.grafetee.com), the men in blue are simply leveraging on technology to make neighborhoods safer. Grafetee is a mobile location-aware application for smartphones and other mobile devices that allows users to update their status with images and text in real-time. The app allows users to create destination guides by bookmarking real world places and events, leave geo-tagged notes for other users, or pull relevant content from open, public data as well as third-party sources such as Yelp, Foursquare and Wikipedia. It’s currently relatively in wide use in Finland, and the Poliisi – the Finnish Police – intends to tap on the app as a public safety tool and help make neighborhoods safer. The idea is simple – Grafetee users can send updates to alert the police in real time of things happening in the area – an ongoing crime or an emergency, for example – without having to make a call. With a simple tap on the app, Finnish citizens can report a dangerous situation that needs immediate police attention. The Poliisi will be dedicating itself to actively monitor the Grafetee public feeds, as well as the online interactive map that will show any reports. “We are adopting Grafetee to test how a social media service is applicable to make the neighborhood safer and to help residents to influence their own neighborhood’s safety,” says Poliisi spokesperson Petri Marjamaa from the National Police Board. It’s great to see the relevant authorities test and adopt available technologies, especially from startup companies, for use in their area of work (instead of spending thousands of dollars of taxpayers’ money). We think the Finnish Poliisi has it right. P.S. It’s interesting that Grafetee doesn’t support Nokia devices, considering Nokia is headquartered in Finland.